The big focus of last season’s trade with the Marlins was Anibal Sanchez, and rightfully so. He was the best player in the deal and had the biggest impact on the Tigers down the stretch. They re-signed him for a lot of money and before the injury, he was having a Cy Young type season. 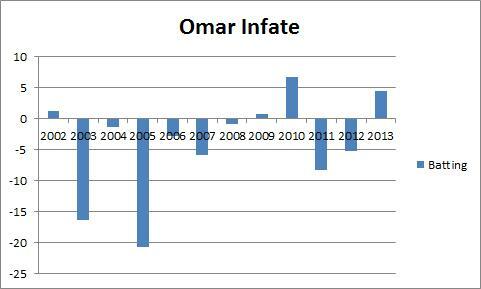 But the Tigers also got Omar Infante back from the Marlins, and Omar Infante has made one of the more interesting transformations in baseball since we last knew him as a Tiger. 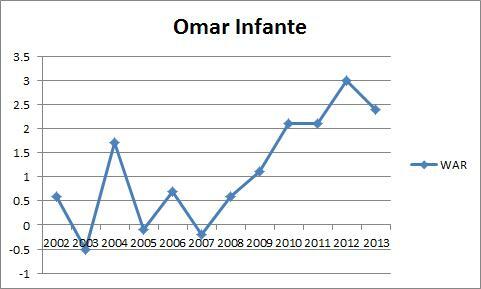 Infante came to the major leagues very young, at age 20, and from 2002 to 2008 only played about one solid major league season. Here are his WAR totals for those seasons, understanding that his PA varied. He’s becoming more and more valuable each season. 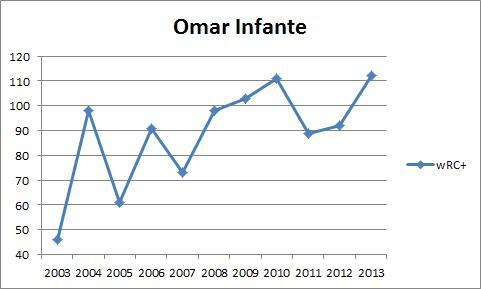 That’s pretty clear and it’s not so crazy to see it given that he is essentially doing it during the peak years of baseball performance (27-31), but it is a big out of the ordinary how exactly Infante is doing it. 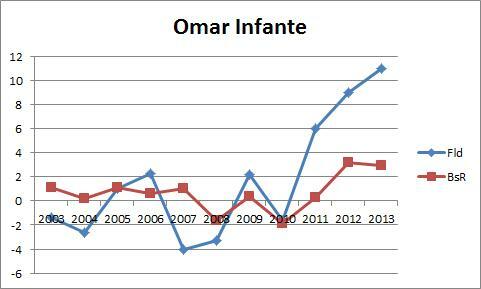 So Infante has become a better hitter, but he hasn’t really become that much better over the last few seasons compare to the previous ones. By 2008, he was locked into a 90-110 wRC+ pocket. That number has fluctuated but he also achieved it in 2004 and 2006. He’s become a more consistent offensive performer but he isn’t a great hitter and has had two below average seasons during his recent breakout. He’s a better hitter than he used to be, but that isn’t what’s really driving his transformation. Infante has become a much better defender and a noticeably better baserunner over the last three seasons and it’s helping him become one of the more valuable second basemen in the game. He’s currently on pace for a 4-5 WAR season, and even if that won’t keep up completely, he looks poised to turn in his best season yet. He’s doing it with defense and baserunning which are parts of a player’s game that are supposed to peak early. You’re supposed to become a better hitter as time goes on and you’re supposed to watch your other skills fade early. Yes his offense is getting better, but the value is coming from turning himself into a good defender and baserunner. 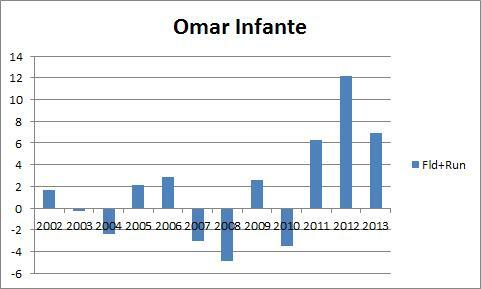 Replacement level and positional adjustments are added to these to get WAR, but you can see clearly that Infante is taking an unusual path toward mid career success. He’s getting better in the field and on the bases and it’s working for him and the Tigers.